Driving downtown. 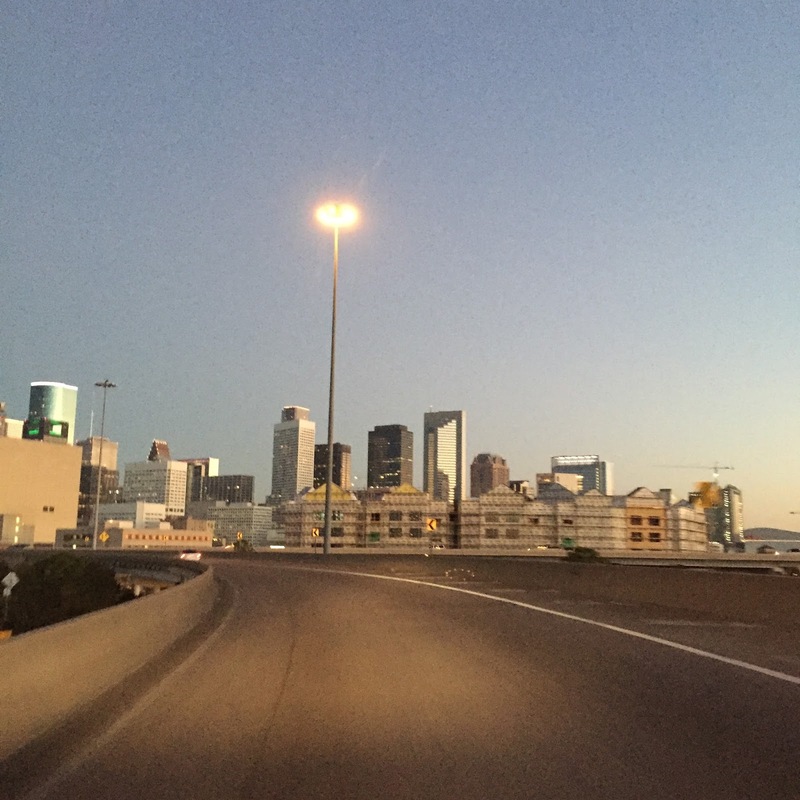 I love the sunrise in the city of Houston. Hello friends! I'm so thankful to God that I am still faithful to marathon training in the midst of this busy season of the year. These past few weeks required a lot of extra off line time from me and I made sure to put my family first and get all we needed to get done. Fitting in runs was no joke but I got it done. Last week some of my friends ran the last Warm Up series race before the marathon and a few of us got our run the Saturday before. It was hot that day but we got it done. 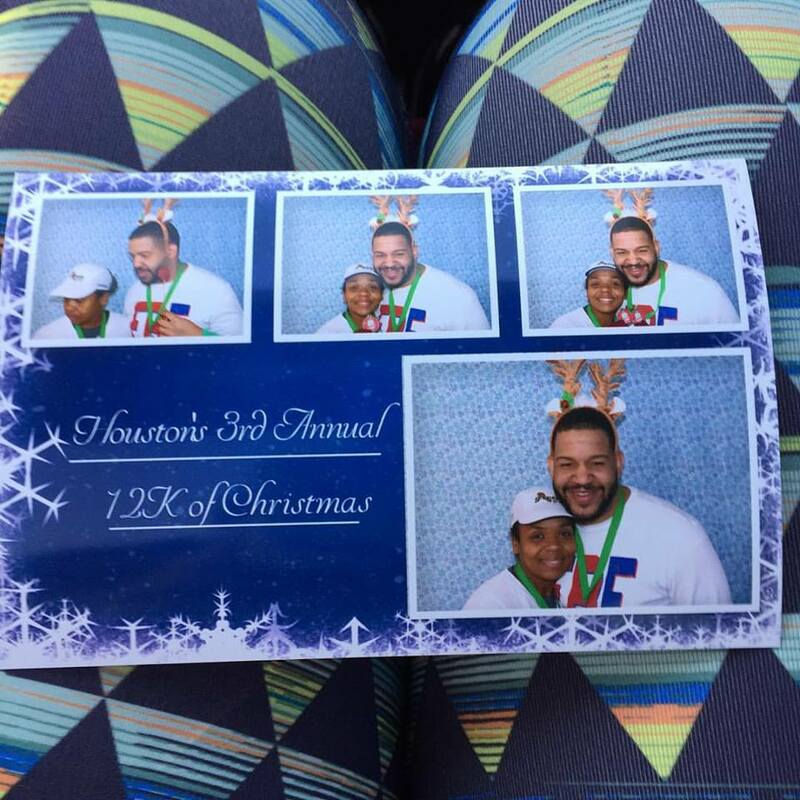 Today, my husband and I were invited to run Houston's 12K of Christmas downtown. It was my first time running and my husband's second. 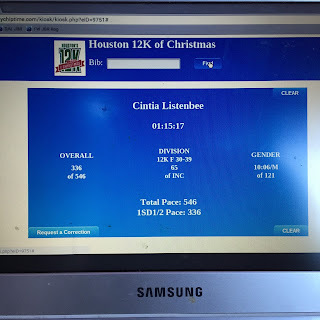 I had never ran a 12k before so I really enjoyed my first experience. 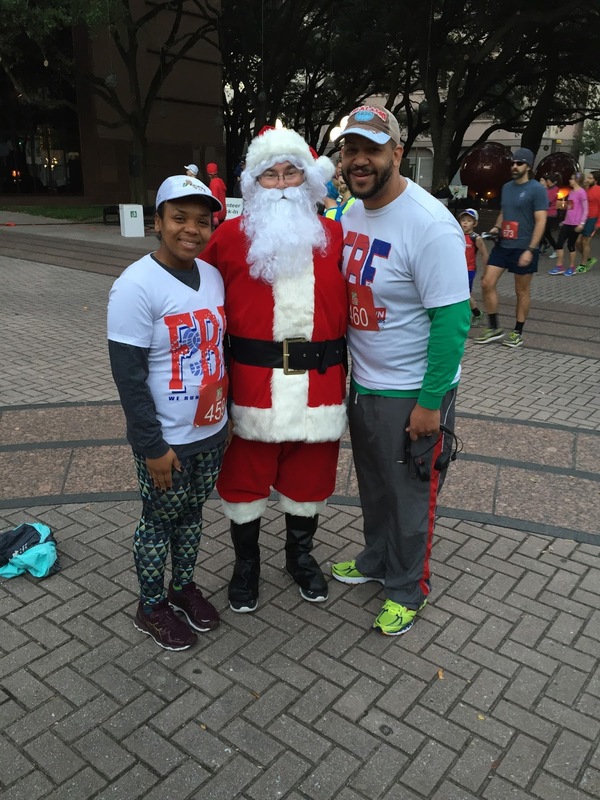 Santa came to the race! Too cool. I never get to run downtown so that by itself was a treat. The view was amazing. The weather was great too. Only one thing went wrong: I forgot to charge my Garmin. I did not know those things lost battery power if the charger was off for a couple of hours. Okay, maybe 12 hours. I went on without my Garmin anyway. What a view! 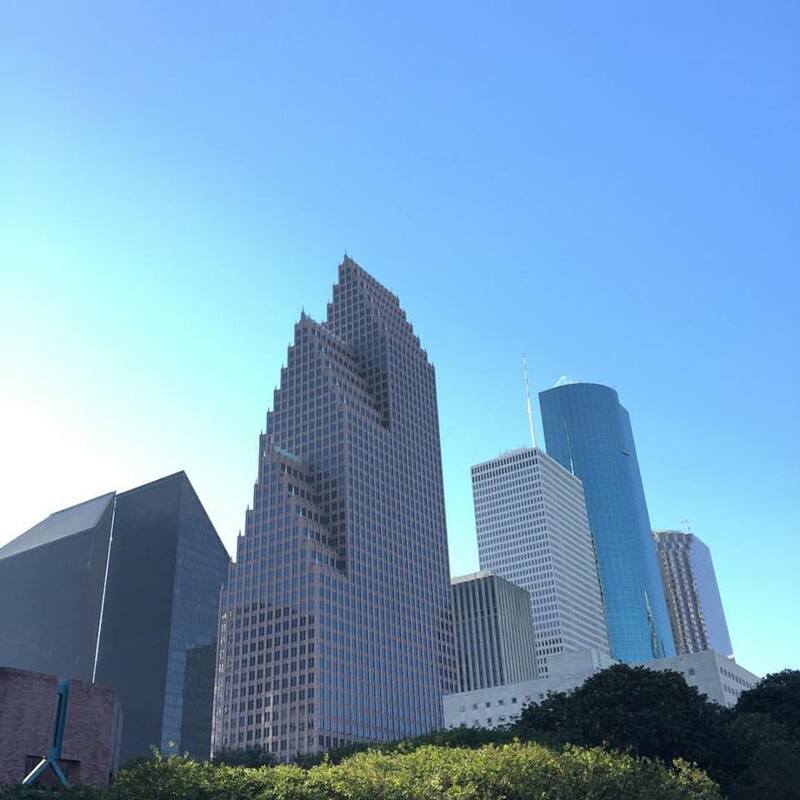 I love the city of Houston. The course was a 2 loop one, starting at the Aquarium. We started the loop by going over a bridge. Yes, we got some hill work done and thanks to God I did really well. 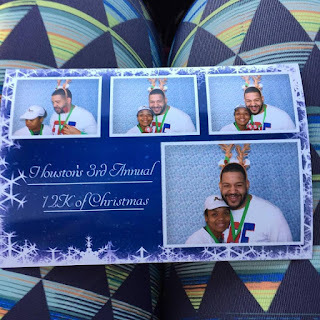 I had a chance to high five my husband several times in the course. This is our third race together and the first time I see him running out there. We love each other and we are very honest about our pace. We see each other in the beginning and whoever finishes first waits for the other. I'm super proud of Zeke! 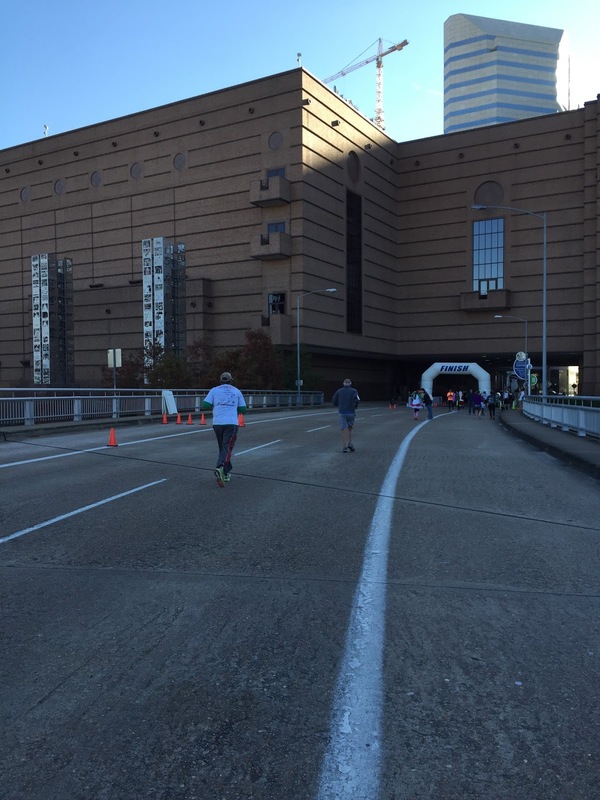 When I saw the finish line, I asked myself "self, should you speed to the end?" My self said "No." So I kept that same pace. I was happy with my time. 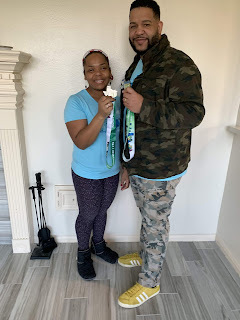 Here I am, proudly holding my first 12K medal. Oh, I need to tell you that they also had a 6K option which was very popular. The post race festivities were super fun. We always take advantage of the photo booth. I think the first one is my favorite. Ha! I was totally going to go back out there and run an additional 10 miles but my family needed me so I decided to stay at home and care for them. There's always next week (which by the way is our final super long run, 21 miles!). Today I am thankful to God that at the end of a super busy stretch of weeks we got to run. I'm thankful for 24 (plus) weeks of training. 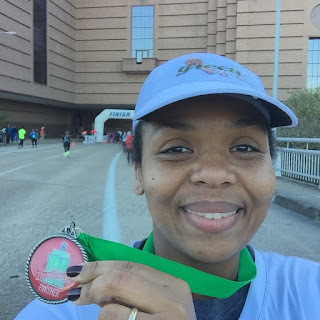 I'm eager to run the Chevron Houston Marathon in exactly 28 days. Keep praying for us!